I received a copy of this book through NetGalley for an honest review. 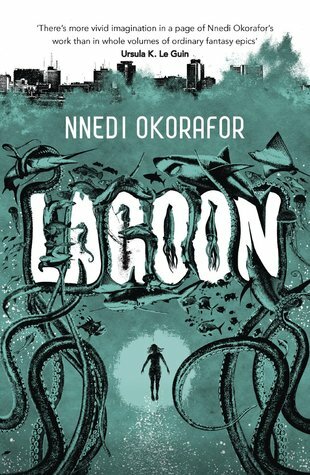 When marine biologist Adaora reaches Lagos's Bar Beach, she never expected to have two strangers walking her way. Nor for a wave to take them and return them with a fourth member, a woman who does not feel right. An alien, perhaps. Adaora names her Ayodele, and soon finds her suspicions are true. Not only does Ayodele shapeshift but she claims to have come to Nigeria as the ambassador of her people, and chosen Adaora and her two newfound companions, Agu (a soldier) and Anthony (a famous Ghanian rapper) as her helpers for establishing contact with the humans. For Ayodele's people don't want to overtake Nigeria. They want to walk with the humans, to help. But when Ayodele presents her offer of peace and change to the city, Lagos begins to burn. It is not often that I find first-contact stories set anywhere other than in the US, let alone in Africa. Even though I am hardly the biggest alien themed books reader, that alone wanted me to grab the book. It was not just the setting itself that differed from norm. Lagoon is a very human book. It is not a book about the scary aliens who come to Earth to take over the world and enslave humanity, about how humans are stronger than any other species, or anything of the sort. No. It is anything but. Lagoon dissects humanity and how it reacts to a crisis. There's no division of black and white, but a complex mush of greys: people who are opportunistic and curious, logical and fearful, desperate and certain, confused and calm. There are people from all walks of life, with all sorts of beliefs. And even those who come from the same "group" regard and act differently, such as two people from the same family and same religion, one of which sees the aliens as God's messengers, and the other who regards them as demons. Okoraftor manages to do so by writing a book with multiple PoVs, some of which last for only a chapter and others that show up multiple times. This way, it is possible to accurately feel what is going on in the minds of the people in such a vast city. Not only that, but in those of sea creatures as well. After all, it was in the sea that Ayodele's people landed. And everyone knows that water is life. There is another point in which Lagoon differs. Even though this is primarily sci-fi, there is a clear fantasy element to it. The author wove Nigerian folktales seamlessly into the story in ways I would never expect. Thinking back on it, it reminds me a little of Gaiman. This symbiosis between alien, folk and even technology only helps to bring out the world even more, to help tasting and understanding Lagos and Nigeria a little further, turning them into living, breathing characters as complex as the people that inhabit the story. A story which is nothing short of original, both in plot and structure. In many ways, I would even deem it unconventional. Most narratives hold a clear goal that the characters must reach by overcoming mishaps. Although Lagoon does present us with an aim, everything is much more chaotic and unpredictable than usual, mirroring life. It is easy to feel disoriented (but not in a bad way). And so, very slowly, the book creeps under your skin, altering the way you look at this and that. Well, I for one know that I will carry Lagoon in my mind for a very long time. "But the story goes deeper. It is in the dirt, the mud, the earth, in the fond memory of the soily cosmos. It is in the always-mingling past, present, and future. It is in the water."